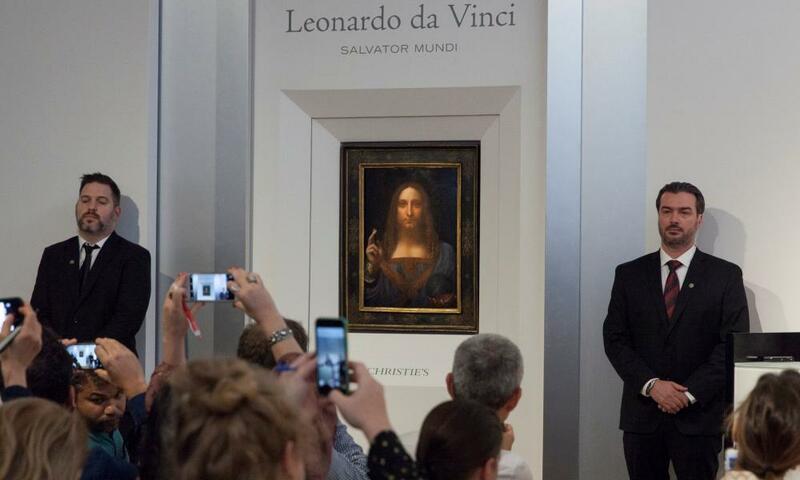 The only Leonardo da Vinci painting in private hands, which fetched just £45 at a sale in 1958, is to be sold at auction with an estimate of $100m (£75m). Salvator Mundi, one of the 15 or so known to be by the artist, was lost for centuries before its authenticity was confirmed in 2011. Christie’s in New York on Tuesday unveiled what it called “the biggest discovery of the 21st century” – the haunting, mesmerising painting of Christ holding a crystal orb in his left hand and raising his right in benediction. Salvator Mundi (Saviour of the World) was, and is, enormously significant because of its rarity. It is the first discovery of a Leonardo painting since 1909. Loic Gouzer, Christie’s chair of postwar and contemporary art in New York, said bringing it to the market was a “once in a lifetime” honour. “Salvator Mundi was painted in the same timeframe as the Mona Lisa, and they bear a patent compositional likeness,” he said. “Leonardo was an unparalleled creative force, and a master of the enigmatic. News of the painting’s existence emerged in 2011 when it was included in the National Gallery’s blockbuster Leonardo exhibition. It was known that Leonardo had produced a painting of that name, but it was assumed it had long ago been destroyed. The work, painted between 1506-13 for King Louis XII of France, has a fascinating history. In the mid-17th century it was listed in an inventory of the collection of Charles I of England, and it is thought to have hung in the private chambers of his wife, Henrietta Maria of France. It was later in the collection of their son, Charles II. The next reference to the work is in 1763 when it was in a sale organised by Charles Herbert Sheffield, the illegitimate son of the Duke of Buckingham. He ordered the auction of artworks following the sale of what is now Buckingham Palace to the king. It then disappeared for 140 years – until 1900, when it was bought by Sir Charles Robinson as a work by Bernardino Luini, a follower of Leonardo. It went into the Cook Collection at Doughty House in Richmond, southwest London, and remained there until the collection was dispersed. The painting next appeared at a Sotheby’s auction in 1958, where it sold for £45. It then disappeared again until it was purchased at a small regional auction house in the US by a consortium of American businesspeople in 2005. At this point, it was attributed to one of Leonardo’s pupils, Giovanni Antonio Boltraffio, but clearly there was a hunch – a desperate hope perhaps – that the work was by the master himself. Six years after that purchase, following research and authentication which involved the world’s leading Leonardo experts, it was confirmed as the real deal and was the star of the National Gallery show. Alan Wintermute, a senior specialist in old master paintings at Christie’s, called it the “holy grail” of old masters. “To see a fully finished, late masterpiece by Leonardo, made at the peak of his genius, appear for sale in 2017 is as close as I’ve come to an art world miracle,” he said. Since its discovery, it has been through more twists and turns with, at one point, Dallas Museum aggressively raising money to buy the painting to help make the city an “arts destination”. It is understood to have been sold privately for more than $75m in 2013. The painting is to travel to Hong Kong, San Francisco and London before it is sold by Christie’s in New York on 15 November. Unusually, it will be sold at the auction house’s big postwar and contemporary art sale, “a testament to the enduring relevance” of the picture, said Gouzer. Another newly announced highlight of the Christie’s sale will be Andy Warhol’s monumental Sixty Last Suppers, painted a year before his death in 1986. It comes with an estimate of $50m.